We won a Freedom of Information lawsuit for these records! 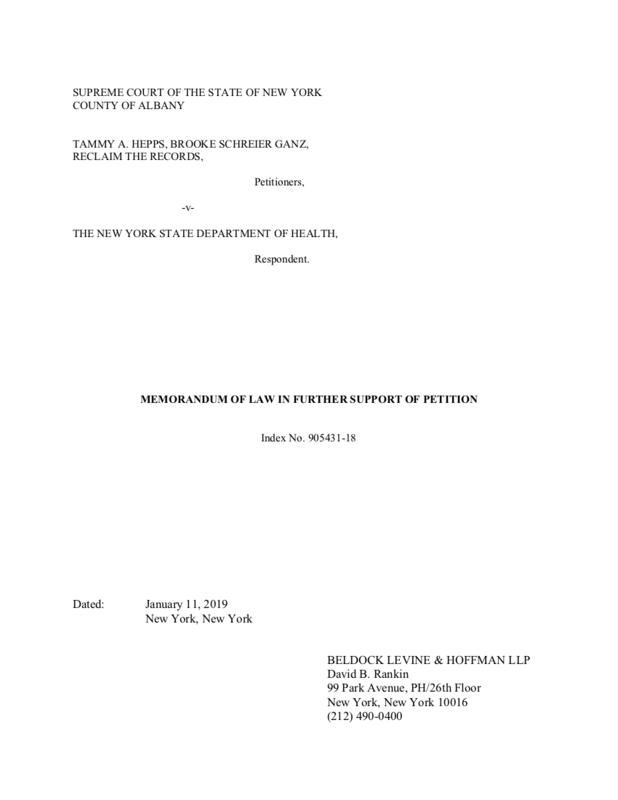 We filed a New York State Freedom of Information lawsuit, also known as an Article 78 Petition, against the New York State Department of Health (NYS DOH) in the Supreme Court of New York, Albany county, on August 24, 2018. And we won. You can browse through the images online at the Internet Archive, totally free. The records for 1881-1964 are online now. Now that we’ve won our lawsuit, the rest of the records up through 2017 should be added shortly, once we receive them from the state. Earlier years are in image format, as scanned images of old microfiche sheets made of computer print-outs, but some more modern years (post-1980’s, maybe?) may be in text database format. We’ll know more details soon. We won our Freedom of Information request for the New York State marriage index for 1881-1965! But then the New York State Department of Health refused to hand over the post-1965 marriage index! So we sued them for the rest of the data in the Supreme Court of New York — and we won! And here’s the long backstory on all that. I would like to receive a copy of the New York State marriage index, from 1881 (or as early as such records are available) through December 31, 2016, inclusive. This request is for the basic index only, which might also be known as a “marriage log” or a “finding aid” or a “database extract” or similar terms. Please note that I am not requesting any actual marriage certificates or marriage licenses. Furthermore, I recently used that case as the basis of two successful FOIL requests and legal petitions for the New York City (not State) marriage license index, one filed in 2015 against the New York City Department of Records and Information Services for the 1908-1929 portion of the marriage index, and one in 2016 against the New York City Clerk’s Office for the 1930-1995 portion of the marriage index. In both cases, the agencies eventually conceded that the information was legally available under FOIL, and I received my records, and later published them. However, those two requests only covered New York City records, as the city and the rest of the state are considered entirely separate vital records jurisdictions, and the non-NYC records are held by the New York State Department of Health in Albany. The Department of Health has already compiled and made available to the public some of the years of this statewide marriage index. For several decades now, the earlier years of this marriage index have been available for free public use at a number of New York libraries, albeit in an old-fashioned microfiche format with availability limited by their locations and operating hours, as well as the deteriorating quality of the microfiche sheets. While the Department of Education does control those libraries, the state vital records microfiche there are still the property of the Department of Health, and are merely on long-term loan to the libraries. Therefore this FOIL request is directed to you at the Department of Health, and not to them. Furthermore, a set of these marriage index microfiche have also been made available by the Department of Health to the National Archives and Records Administration (NARA) facility in Manhattan. The public statewide marriage index on microfiche only covers marriages that took place through approximately 1965 or 1966; it does not extend up to the present day. Perhaps the state felt (incorrectly) that because actual marriage certificates are restricted from the public for a rolling fifty-year period that the basic index to the marriages must also be restricted for fifty years. However, this is incorrect based on the plain reading of the 1993 Gannett case referenced above, and as evidenced by numerous Advisory Opinions issued by COOG in the years since then, not to mention our own 2016 success in winning the NYC marriage index records all the way up through 1995. Therefore, this FOIL request includes all years of the state marriage index up through 2016, and does not end merely when the publicly available microfiche production ended. I would prefer to receive these records in raw database format, preferably in SQL or CSV format on a USB hard drive, wherever possible. Clearly at some point there was an original state database that was printed out to create the pre-1965 paper copies, which were then photographed and turned into the microfiche. However, if that database is no longer available — and if not, why not? what happened to it? — then I will settle for high quality digital scans of the microfiche sheets, although I recognize they may be damaged or degraded. For more recent years (post-1965 or so), I presume some sort of compiled or transcribed database does still exist, as those years were never turned into microfiche; for those recent years, I would like to receive the files in their raw database format. I am willing to pay the costs associated with the records production, along with the costs of the USB hard drive and any insured shipping costs to California, if needed. Please inform me of any potential charges in advance of fulfilling my request. This request is not being made for commercial purposes. The requested records will be scanned and uploaded to the Internet, and will be made freely available to the general public. It is anticipated that some non-profit genealogical groups may choose to transcribe the information in the marriage index, to turn it into a new text-searchable database. We would be happy to share any such database with the Department of Health. They just wrote a seemingly innocuous letter to us saying “I have enclosed documents responsive to your request” and sent off the USB hard drive — and also sent it to the wrong address, to MuckRock’s headquarters in Boston. It wasn’t until we finally received their drive and plugged it into our laptop that we realized that something was wrong — decades of data were missing! So then we had to scramble to get someone from NYS DOH on the phone to explain where the heck the missing records were. Are you kidding us?! Reclaim The Records had already won records in this exact legal situation two times before, in two different lawsuits in New York City, where we successfully fought for copies of the city’s 1930-1995 and 1996-2017 marriage index. And we even cited the first of those cases in the text of this new request, thinking that we were making life easier for NYS DOH if they could easily see that they didn’t have a legal basis for restricting the records. We even cited the original 1993 Gannett Newspapers case that originally opened up the marriage license index in the state. But NYS DOH apparently decided that they didn’t want to abide by any of those previous court decisions or settlements. Worse still, because there was a delay in discovering the missing years of data due to no written notice and a wrong mailing address for our hard drive, NYS DOH then decided that our appeal wasn’t timely, because more than thirty days had elapsed. They told us we were out of luck, had missed our window — and besides, we wouldn’t have won anyway. Whomp whomp. And we were all OH NO YOU DIDN’T. We tried again. This time we had a different member of our Board of Directors make an almost identical Freedom of Information request for the marriage index, but submitted under her own name and e-mail address and asking for slightly different years: 1968-2017. And the NYS DOH didn’t even bother to reply to that second request at all. Even though that’s legally required, for every Freedom of Information request. And that means her FOIL request was “constructively denied”. So as soon as we could, our attorney filed a new appeal for this second request. And this time the NYS DOH was like, pshhhhaw, you people are asking for the same exact stuff that we said no to last time, and you’re probably trying to subvert time limits or something, and look, we’re totally going to gloss over the fact that we never replied to you at all like the law said we have to, but whatevs, we don’t have to listen to your dumb request anyway. Well, uh, funny story: they did have to listen to it. Because our attorney successfully combined the two requests, the original one for 1881-2016 and the revised one for 1968-2017, into one mega-lawsuit which we filed in the Supreme Court of New York, Albany on August 24, 2018. Yeah, we did this Article 78 petition Voltron-style. Here’s the court filing. Another funny story: our Board Member had included the following line as her sign-off in that second request: “For the record, if your office chooses to deny this FOIL request, this is absolutely going to turn into a lawsuit.” Like, we literally told them exactly what was going to happen. And they still ignored the request, and then denied the appeal, and then still didn’t think we would follow through. It’s so weird how government agencies keep getting all surprised when we expect them to do what the law says and then we go do exactly what we explicitly told them we were going to do. It’s not like our motives or our plans were some massive secret! We’re Reclaim The Records! We do exactly what it says on our label! Anyway, long story short, we won our lawsuit on March 13, 2019. Note that this index does not contain lists of marriages from New York City. New York City is considered to be an entirely separate vital records jurisdiction from the rest of New York state, and consequently the city has its own birth, marriage, and death indices. However, a small number of NYC marriage listings are found scattered throughout this index, often because the marriages happened in towns that were previously independent before the consolidation of the city in 1898: for example, a pre-1898 marriage in a place like Canarsie (Brooklyn) or Flushing (Queens) might be listed here. To access the marriage license index data for New York City, please visit NYCMarriageIndex.com, which compiles the 1908-2017 data obtained by Reclaim The Records in three previous successful Freedom of Information lawsuits against the New York City Municipal Archives and the New York City Clerk’s Office. Please also note that marriages that took place in the cities of Albany, Buffalo, and Yonkers are not included until about 1914 or 1915; those three cities did not initially participate in the statewide registration of marriages and kept their own records. This record set is only the index to New York State marriage records. If you find a name of a relative or other person of interest in this index, you can then place an order for a copy of the original marriage license or certificate, which will have much more information on it, such as the spouses’ places of birth and the names of their parents. In New York State, a marriage license which is more than 50 years old is considered to be open and available to the public. Marriage licenses less than fifty years old are open to the public only if both parties to the marriage are deceased and you can provide proof of their deaths, or if you are an attorney or legal representative of one of the parties. You can order a copy directly from the NYS DOH in Albany. Alternately, you can also try ordering a copy from the exact city clerk or town clerk, which may be faster than dealing with Albany but which might only provide a typed extract of the information on the certificate or license, instead of a photocopy version. 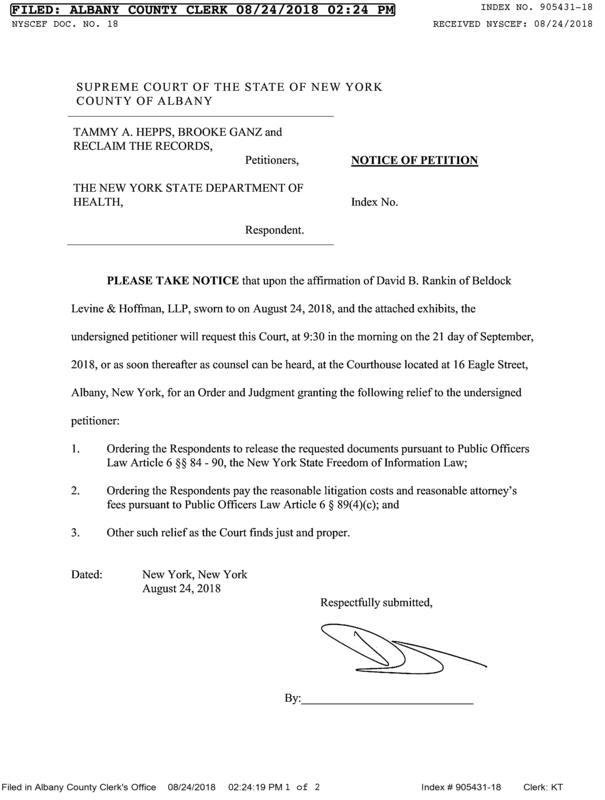 Thank you to our awesome New York FOIL attorney David Rankin of the firm Beldock, Levine, and Hoffman for helping us win public access to these records, and for adroitly handling our lawsuit. 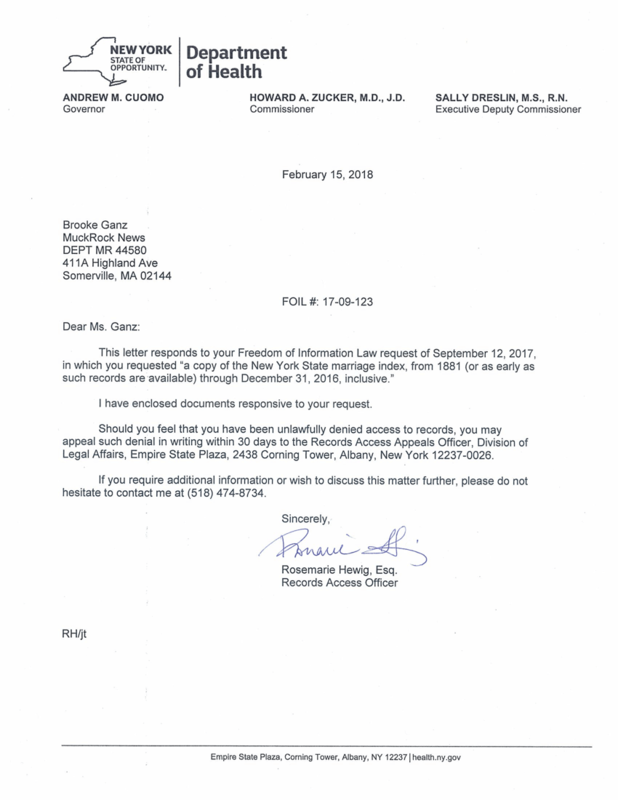 The NYS DOH initially sent this letter saying that they had granted our FOIL request from September 2017, along with a hard drive full of the files we had asked for. But nowhere in this response letter did they ever state that they were also withholding many files -- anything less than fifty years old. 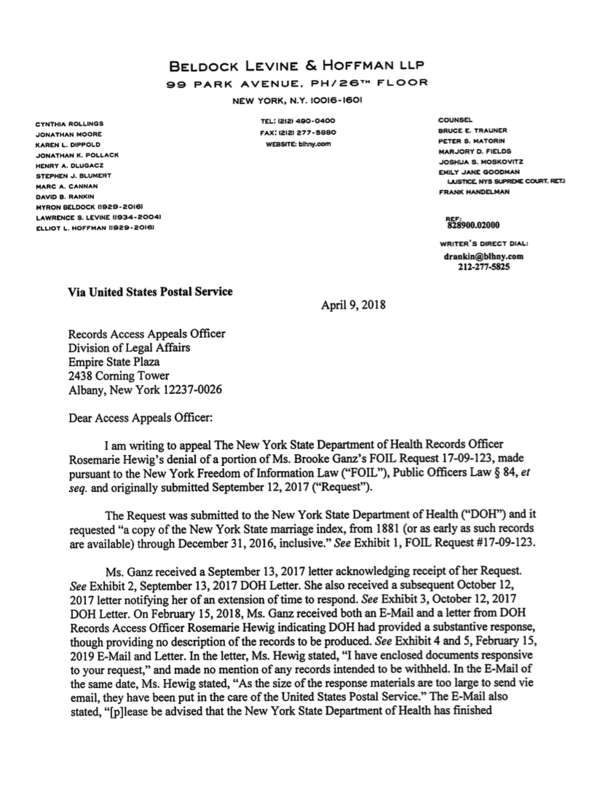 Because the NYS DOH also mailed the hard drive to the wrong address, the missing files weren't noticed until one month later, mid-March 2018. 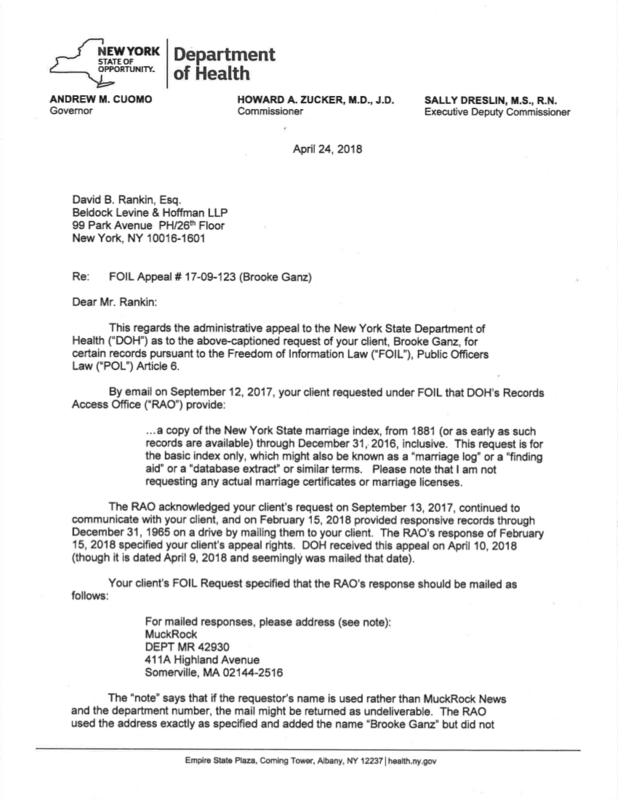 The NYS DOH finally verbally confirmed that they were withholding files in a phone call on March 30th, but did not follow it with any written confirmation. 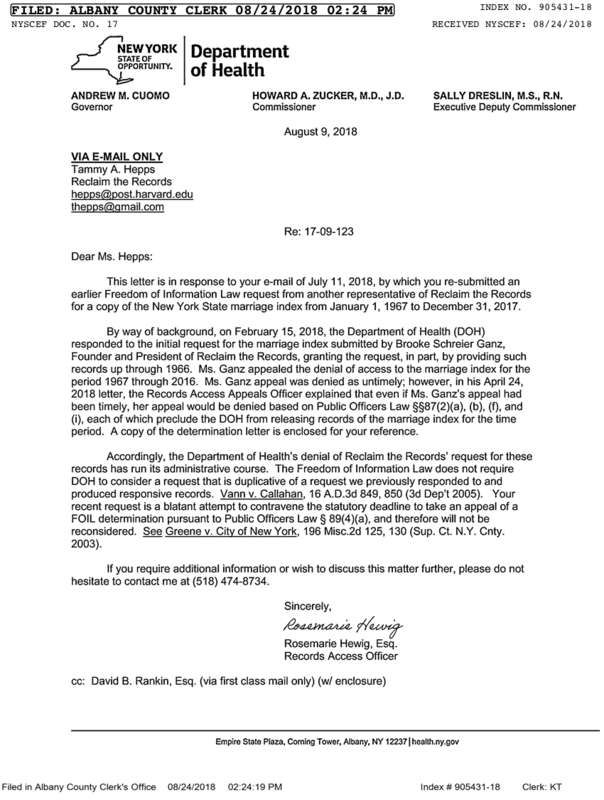 Our FOIL Appeal to the NYS DOH, arguing that we should have been given all years of the marriage index, because while actual marriage certificates and licenses have privacy protections, in New York the basic index or "log" does not. Which we had, y'know, cited in our actual request. Furthermore, they were supposed to have told us in writing that they were withholding files, and also supposed to have told us why. The NYS DOH responded to our appeal, claiming that not only had we missed a deadline for appealing (even though they never let us know in writing that there was anything withheld to potentially appeal, and had also mailed our hard drive of files to the wrong state) but that the index less than fifty years old should not be released to the public in any case. They also attempted to cite the Model State Vital Statistics Act, even though it was never adopted in the state of New York, and was in fact rejected as a nationwide standard by the Department of Health and Human Services several years ago. Because of the lingering questions about the time window of our first FOIL appeal, we decided to make a brand new FOIL request. We asked for the same index files we requested earlier, but with slightly different years requested: 1967-2017 instead of 1881-2016. And this time, our Treasurer submitted the FOIL request instead of our President. 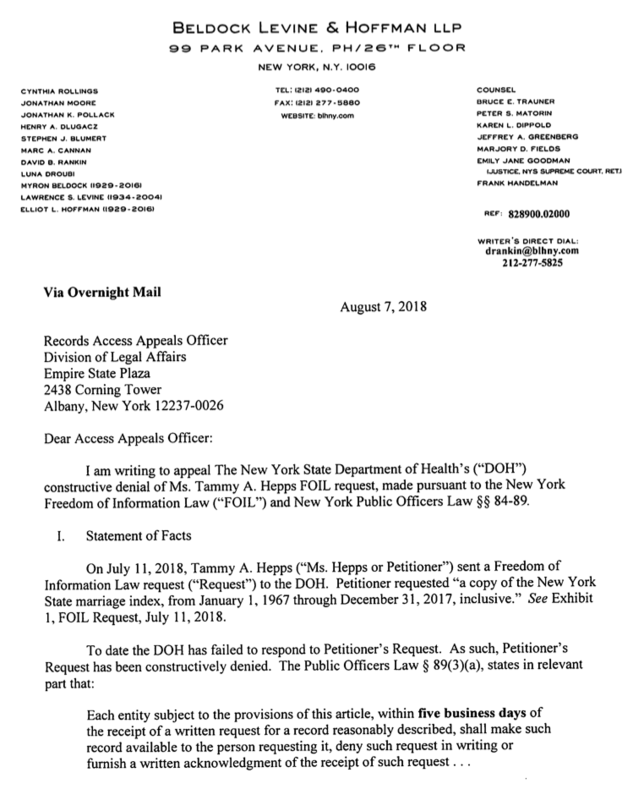 The NYS DOH hastily responded to our second FOIL appeal, even though they had never bothered to respond at all to the actual second FOIL request. They claimed that they didn't need to respond at all, because this requestor was from the same organization and was just trying to get around time limits on FOIL requests and responses, or something. 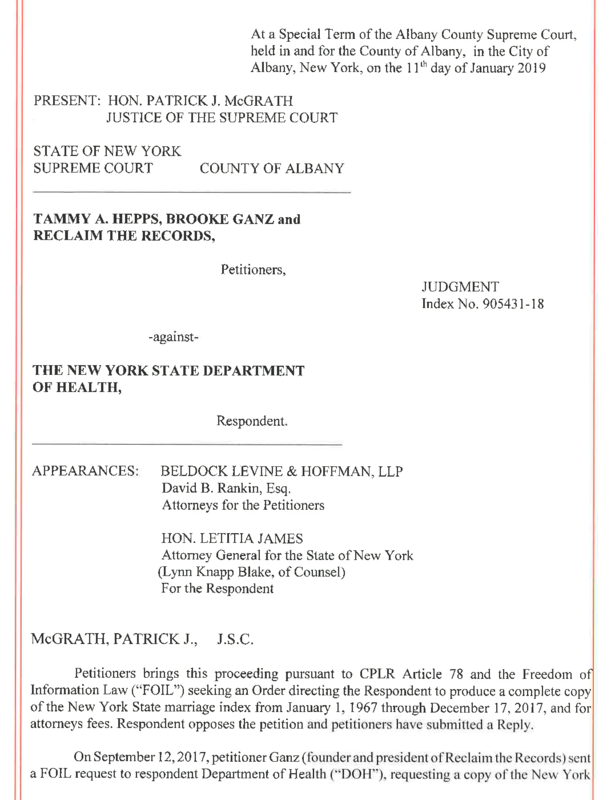 And here's the actual lawsuit, filed in the Supreme Court of New York, Albany county. The lawsuit combines both FOIL requests into one case: the initial one filed by Ganz in 2017 for 1881-2016 and the subsequent request filed by Hepps in 2018 for 1967-2017. In which we explain to the state in great detail why they're wrong. And...we won! Read the judgment here.